Roofmasters Roofing Co., Inc., owns and operates it’s own sheet metal division for both residential and commercial buildings. Although the popularity of metal roofing has greatly increased in recent years, most people are not very familiar with this type of roofing material so there are many misconceptions. 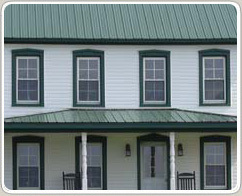 But metal roofing provides many benefits over conventional roofing materials. It is durable, long lasting, saves money and provides a comfortable environment for your family. We work with various types of metal such as panelized metal, lightweight aluminum, copper and other metals. It may cost more initially to install a metal roof, but cost in the long run will be much lower than a home with an asphalt roof. A metal roof will last 20 to 30 years longer than conventional asphalt roofs. Metal Roofs are lightweight and installation is quick and simple. Choose from a variety of colors for aluminum or 24 gauge Kynar painted steel finishes all of which add beauty and value to your property. It has also been demonstrated that the home’s value increases with metal roofing. 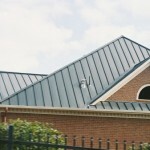 In some states, a metal roof can even lower your homeowner’s insurance premiums. A metal roofing system offers unmatched durability, lasting 2 to 3 times longer than conventional roofs. Chances are good that a metal roof will be the last roof you ever install on your home. No matter what kind of roofing style, color or finish you have now, there’s a metal roofing style to match. Today’s metal roofing looks just like common roofing material such as asphalt shingle, clay tile, cedar shake or slate. Metal Roofs lasts at least 2 to 3 times longer. Metal Roofing is Energy Efficient Metal roofing in both light and dark colors reflects heat effectively to reduce cooling loads in the summer and insulate homes during the winter. This can help to lower energy bills. In most cases, a metal roof can withstand decades of abuse from extreme weather like hail, high winds, and heavy snow. Today’s systems also have a 110-mph wind rating (equal to an F2 tornado), meaning your metal roof is also safe from wind gusts.